As a student at Eastern Mennonite College, where my un-cut hair was piled neatly under a prayer cap, serving the church was held in high esteem. 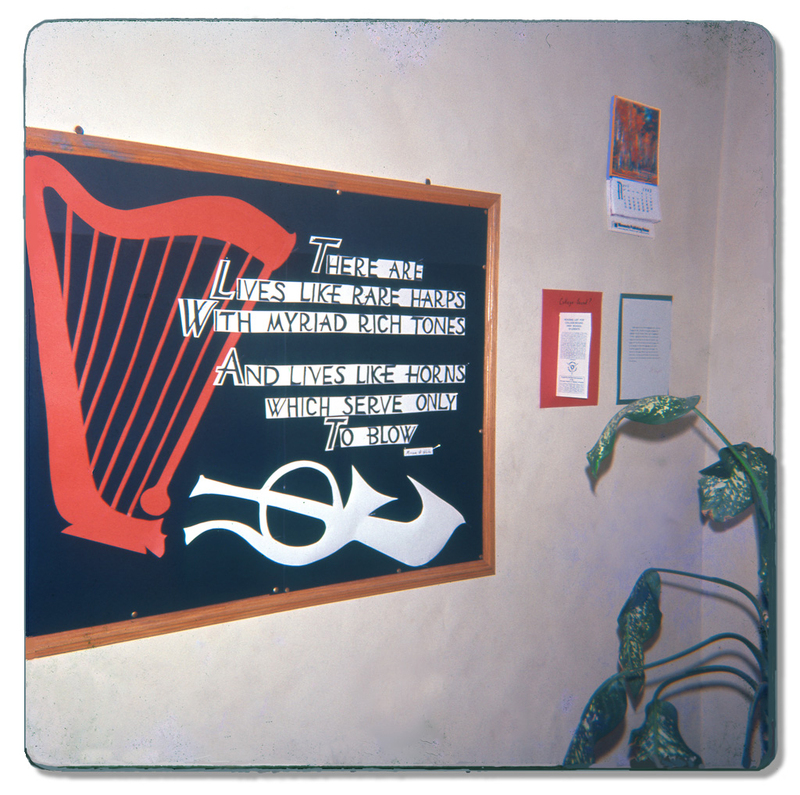 In fact, the idea of service was drummed in to me as a teaching intern. And so, when the dean of education at the college suggested I apply to Lancaster Mennonite School for my first teaching job, I jumped at the chance. I could serve God and pursue a career I already knew I loved. I didn’t wear a wimple, scapular, or tunic either. 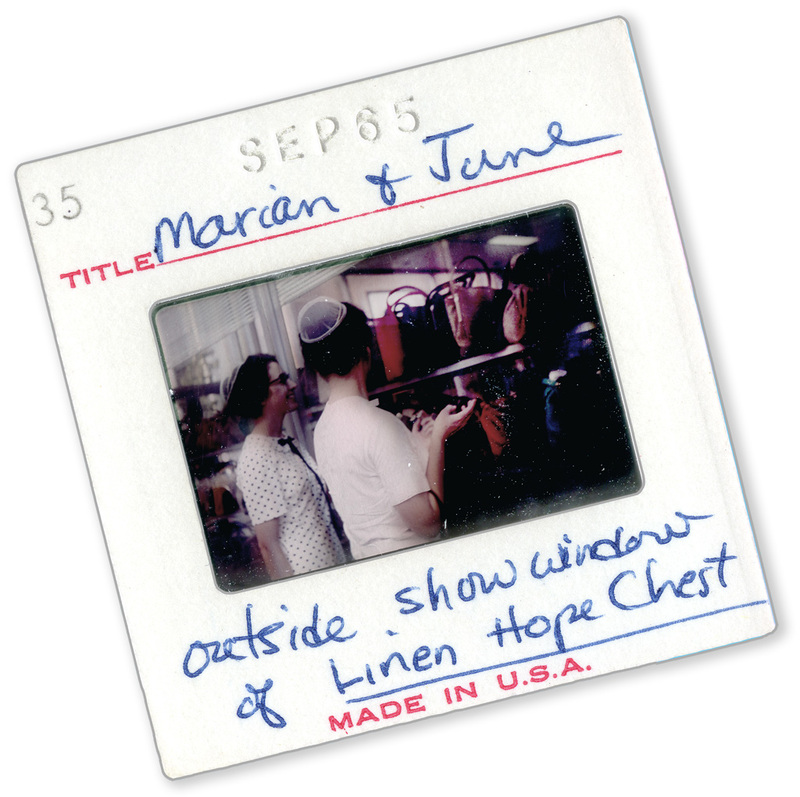 But, as a Mennonite girl in the 1960s, I did wear a prayer veiling and caped dress. My prayer veiling served to acknowledge my obedience to church rules while a cape over my bodice muffled whatever feminine contours I may have had then. Like Karen Leahy, known as Sister Marie Cordé, my clothing announced my separation from the world before I uttered a word. It also assumed a higher set of expectations from me. Even before I joined the faculty at Lancaster Mennonite School, I wore a prayer veiling and a caped dress, but not all the time. Just for church. 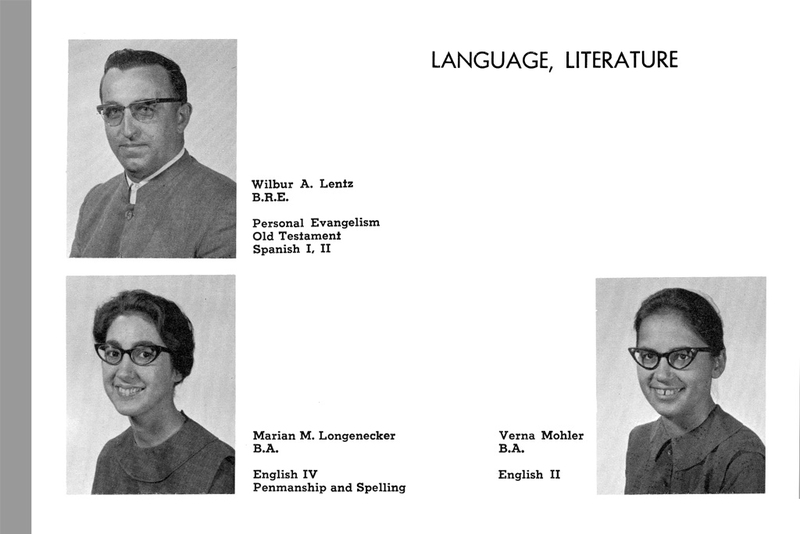 But now as Sister Longenecker, a teacher at LMS, plain clothing was de rigeur, not optional. And I could do so with one of my EMC classmates, Verna Mohler. She and I had shared dorm space at EMC. Now we would transplant ourselves into a similar arrangement as beginning teachers at LMS. Verna and I were side by side and plain. She taught American Literature, and I English Literature along with Penmanship and Spelling. Yes, side by side in the yearbook, The Laurel Wreath, whose table of contents featured 5 divisions: Faculty, Students, Organizations, Activities, and Worship. There was no orchestra or band – no football or basketball teams then either. Certainly no theatre. 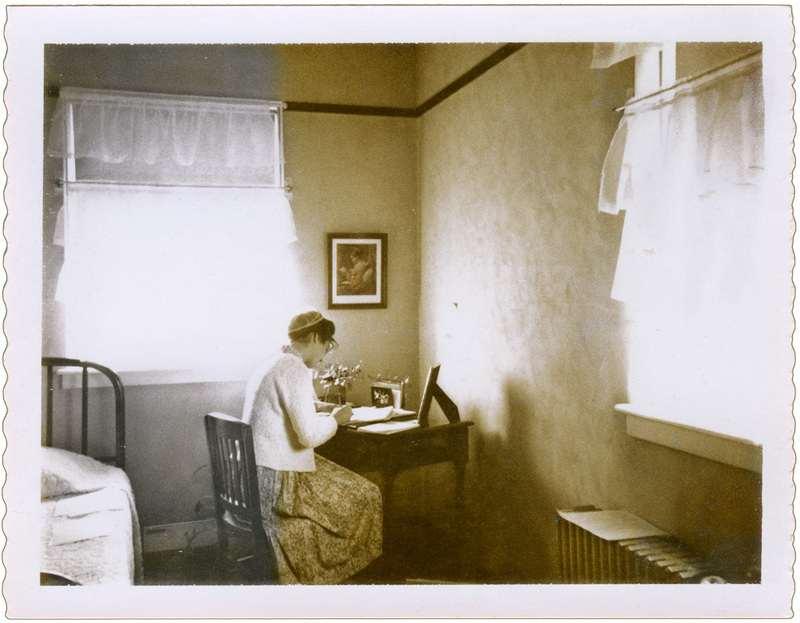 During our first year of teaching we lived in adjoining rooms in the girls’ dormitory, an awkward situation because of the proximity of students. One evening before supper, I took off my cape and went to the dining hall with just a sweater over my dress. A perceptive student reported me to the Dean of Girls, who gently suggested I mend my ways and remain caped around students at all times. Of course, our students were plain too . . . 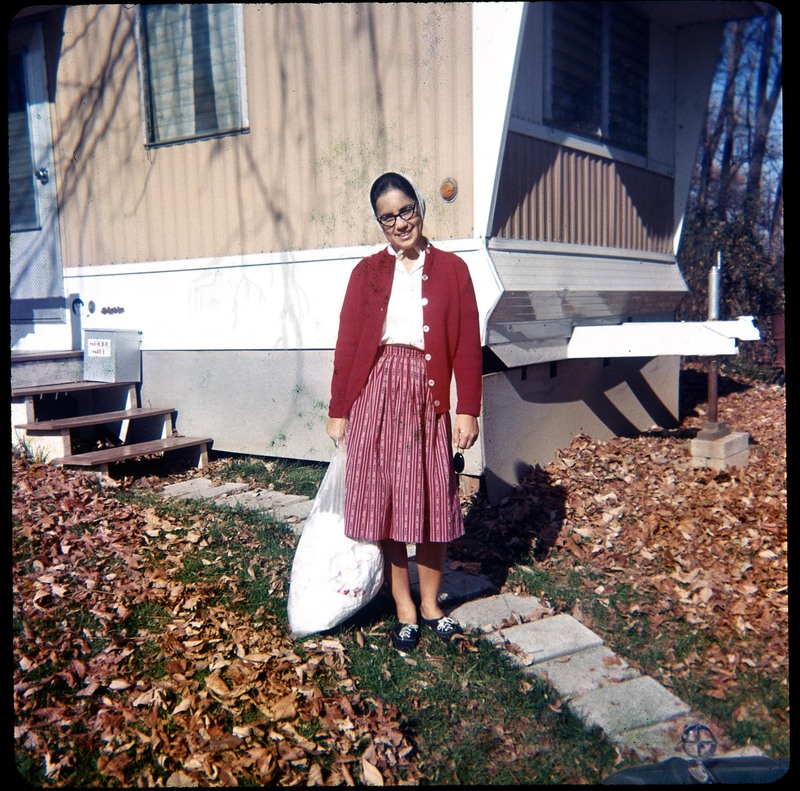 The second year Verna and I moved out of the girls’ dormitory and lived on the edge of campus in a mobile home, which we shared with June Sauder, the Home Economics teacher. Our trailer was situated in a park-like setting on the other side of the Mill Stream, a bridge between us and campus buildings. Here again I flirted with danger. One of us rented a TV to see the shocking story of the Kennedy assassination unfold and subsequent funeral proceedings. A student noted the blue glow from our trailer window and reported us to the administration, an action for which we were reprimanded. However, words that we heard on the broadcasts became additions to our students’ vocabulary knowledge: cortege, caisson, requiem. Sometimes after hours, we skipped wearing the prayer coverings, but always had our heads covered, even if it was with a filmy white bandanna. 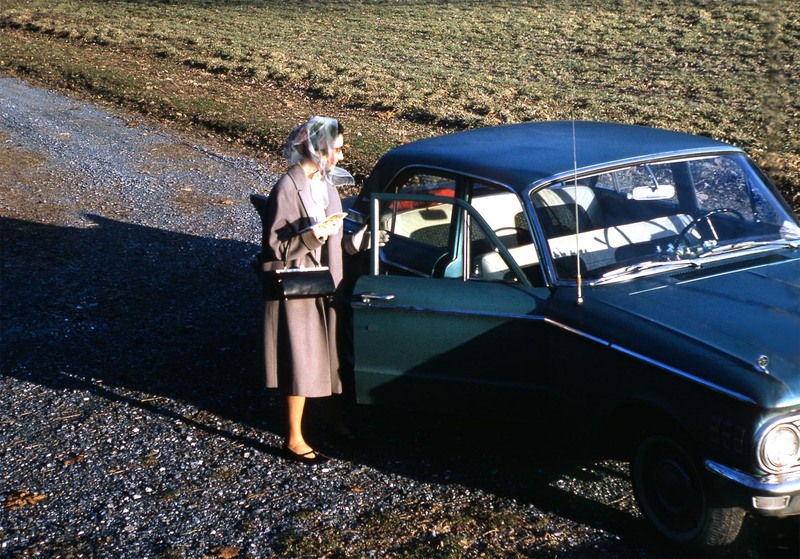 Verna’s Comet became our get-away car when June, Verna and I drove into Lancaster city with serviceable black purses to admire fancy red ones in a shop window, our expressions hopeful. The Lancaster Mennonite School publication, Bridges, to which I still subscribe, has changed dramatically since Verna’s and my short tenure there. Student rosters now include names like Rodriguez, Rosenfeld, and Fukuhara along with the typical Lancaster County Mennonite names Weaver, Harnish, and Nissley. The LMS sports teams are going to the playoffs this year. Lancaster Mennonite and Lancaster Catholic are competing in an international ping-pong tournament. 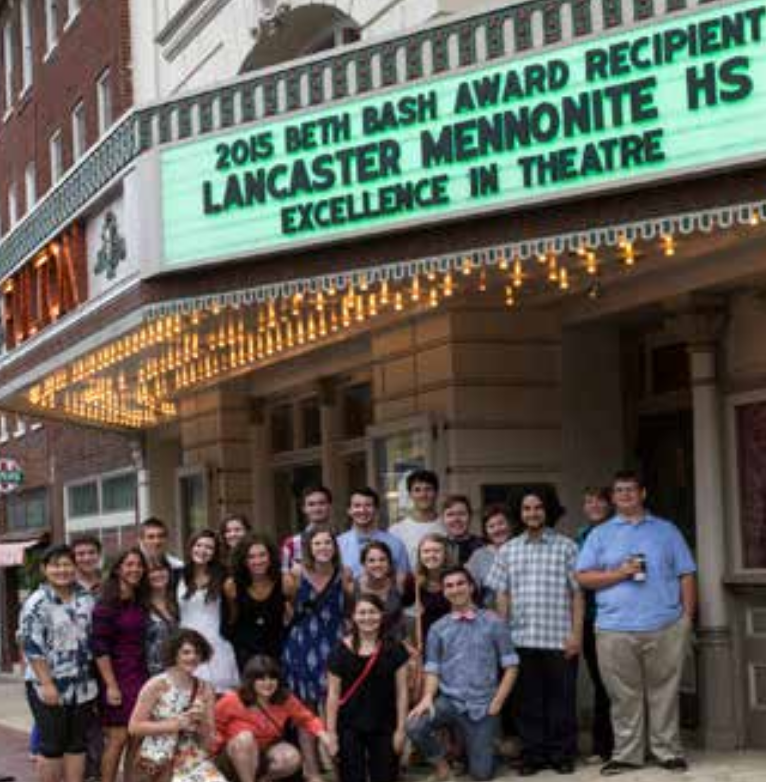 Most interesting of all, the name of Lancaster Mennonite High School appears on the Fulton Theatre marquee in downtown Lancaster displaying the 2015 Beth Bash Award for Excellence in the performance of Shakespeare’s The Tempest. Imagine! Is your life, like mine, dramatically different now from your childhood experience? Share your story here. Thank you for sharing your early experiences as a teacher. It is so foreign to my own experiences. So funny now to think of you being reprimanded for not wearing your cape or watching a TV. It seems that you both loved your experience and sense of mission and chafed a bit at the restrictions. The Mill Stream bridge is beautiful. Though you noticed our many restrictions, it is interesting that you observed too that my love of teaching and camaraderie with colleagues seeps through, maybe even over-rides it at times. Thanks for your constant camaraderie, Merril. And thanks for yours, Marian! I just read your fine review and noticed it was published in 2008 just a year after I presented a paper at the Oxford Round Table with two of Karen Armstrong’s works in my bibliography: The History of God and The Spiral Staircase, a memoir I have admired for the author’s unflinching self-awareness and honesty. Reading the book, I remember feeling such sadness that her terrifying illness was un-diagnosed for such a long, long time. You are one of the few of my blog commenters who can say with strong feeling: “Coverings and capes can only cover so much of us.” Chuckle-chuckle! I heard many stories from LMS from my EMU friends–and admired the beauty of the campus on visits. Somewhere between coverings, capes, and long skirts–and the “no-shorts policy except for physical education or sports” at EMU when I was there (’71-75) — and today’s short short shorts that barely cover the underwear waddling or sashaying over campus — is a happier medium. And now I sound and feel very old. You are not old, Melodie. But you are fortunate to have the wisdom of experience and the long view of personal history with a telephoto lens. Love reading about your life! As a Lancaster Countian, you viewed this life too, Pat, from a short distance. I believe, though, you probably had fewer restrictions as a non-Mennonite. Thanks for taking the time to comment on your busy, busy day. Wonderfully clear recollections that show a world foreign to most of us who lived in the same era. Your slice of life and mine during the same period would be vastly different. And that’s what makes the world go ’round – ha! Thanks for reading and commenting here and then sending a tweet into the Tweet-o-sphere. Huge Hugs back to you, Sir David. Catholic upbringing was a bit too strict for my liking and a lot of it didn’t make any sense. I suppose that’s one of the reasons I am an atheist today. One thing I did like, was the respect we showed our elders, whether they were our parents, teachers or neighbours, and it wouldn’t cross our minds to be rude to them. Sadly, working in a school today, all that seems to have gone and one does feel undervalued and unappreciated sometimes. I haven’t got a problem with dress attire or how one chooses to wear their hair, but manners are important and lack of respect, regardless where it comes from, is very painful indeed when one is at the receiving end. I hear what you are saying and understand your distress at not finding respect and good manners among school children. I don’t remember a single discipline problem at Lancaster Mennonite School in those days, but some of the students, especially boys who knew they were headed for farming, were not very motivated to study. Thanks for the comment. By the way, I have enjoyed your picturesque tour of Germany this summer, Fatima. I believe that your upbringing influences your attitude towards Education and some families just don’t seem to appreciate it. Wow, Marian. I’m glad you broke a few of those rules so I can read about all this. I also imagine how close and safe you felt in Mennonite Community, so there were wonderful rewards as well as the inner strength that comes from faith. And a little reprimand here and there? Seems it didn’t stop you. Until I was 12, I lived in a small town in MIssouri where my dad had been raised. We belonged to a Presbyterian Church, to community, and to family. When we moved to a suburb of Detroit, all that was lost. My parents and then my mother after Dad died didn’t attend a church or make new deep connections. As a college girl, I longed for a sense of faith and community. I found that with Vic when we entered a bookstore in Ithaca, NY in 1967 and began learning about meditation, world religions, philosophy, and psychology. Yes to bridges wherever we find them and however we make them. Thank you for filling in some of the detail of your faith search as a young woman. You have certainly found community online in recent years and through the publication of your fine book. Congratulations too on your upcoming appearance on NPR. The sky’s the limit for you, my friend! What wonderful memories Marian. It is these experiences that make us who we are today. My life is much different now than when I was growing up on the Canadian prairies but I am happy I have those memories. Thanks for sharing. You have a close-knit family as I recall from the reunion pics you posted this summer. Also, I seem to remember that you have a strong connection to a faith community too now and in your family history. Thanks for pushing “pause” in your busy life and posting here, Darlene. Marian — YOU having to “mend your ways” cracked me up! You’re one of the most positive, uplifting, constructive, and healing people I know. I still can’t wrap my mind around YOU flirting with Trouble (notice the capital T)! Seven or fifty seven — I’m still the same old [mischievous] me! Oh, Laurie, I think “mending my ways” and “flirting with trouble” was my way of telling you how the administration viewed me then, someone to be reined in. A bit recalcitrant but educable, perhaps – ha! Don’t ever change, Laurie. It wouldn’t be YOU without a hint of mischief. The particular details of your first teaching years are wonderful. Of course it makes me wonder if you will provide more details on the entry into the “Fancy” world. Yes, there is something closely related to your/my upbringing and a convent. Before our ancestors were Mennonites, many were Catholic and many were a particular kind of Catholic, including Benedictine, where life is formed and fashioned through The Rule of Benedict. That formation still lingered (lingers?) in Mennonite religiosity that moved us more toward monkhood than toward prophet- or warrior-hood. Yes, your comment helps me remember that Menno Simons, the founder of the Mennonites, was indeed a Catholic priest, adhering to strict, patriarchal rules. I appreciate the compliment coming from one who knows the culture well, Dolores. Thank you! About the details. I suppose more will be forthcoming when these posts become expanded into a memoir draft. Who is Karen? I don’t understand the reference. Karen Leahy is the author of the book I reviewed to which I provided a link in the first paragraph. Only if you click on the link, would you know the book title, The Summer of Yes. I’ll try to clarify this. I appreciate your pointing this out, Athanasia, and thanks for always for reading and commenting here. Oh, thanks for reading and commenting. My best to hubby too! I think we did skits when we advised the literary societies, Herculeans and Socratarians. Is that what you were thinking of – or something different? Again, thanks so much for contributing slides and photos for this blog post. 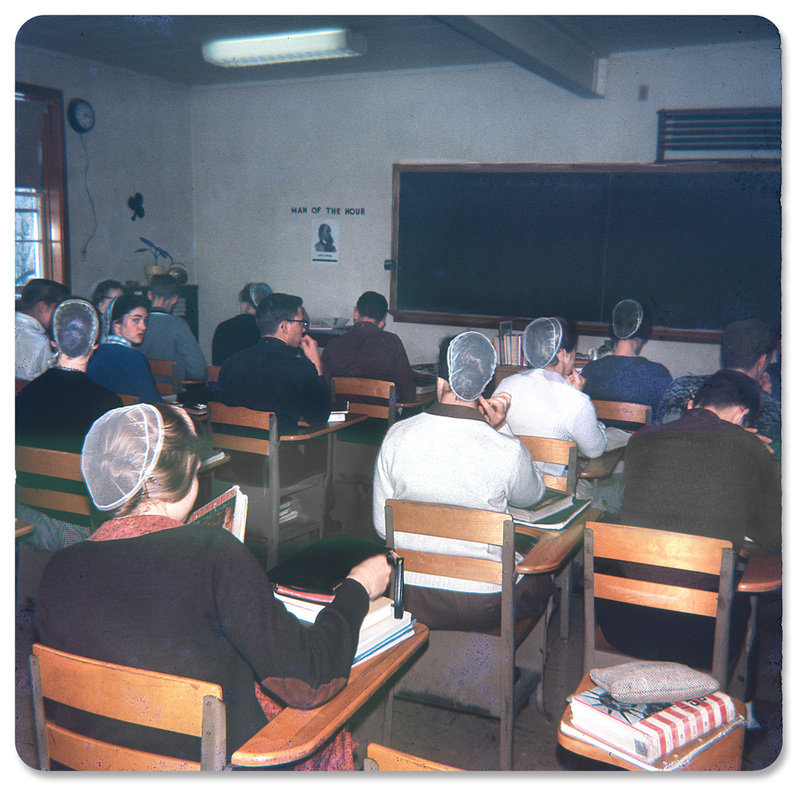 As you can see, many were entertained – and informed about Lancaster Conference Mennonite education in the 1960s. Wow! “That spark of a little rebel at heart” made me smile! And I agree, the older we get the more we become our “selves,” which often includes a little bit of mischief too. How wonderful to read of your experience and enjoy these old memories. I am sure your experience is so much different from mine. Yes, precious memories preserved, like yours, in words and pictures. Thanks, Fiona! Marian, I love this post and seeing the a bit of rebel show up in you as you watched TV through the Kennedy assassination. What a time that was and I believe important for everyone to have seen it unfold. Prayers were very much needed and for that matter still are when it comes to our world today. Yes, we are approaching this time of remembrance. We all can recall where we were when we got the ominous news of the shooting. I’m sure the LMS administration didn’t get the report from a TV. But I remember an administrator coming to the door of my classroom with the message. My legs felt like lead when I walked back to deliver the awful news to my students. You are so good to read, reminisce and reply here, Joan. What a wonderful post. Far different from my upbringing, one that i think would have preferred. Yet God knows what we need to make us the people he wants us to be. Kind of like the book the tale of three trees. Which i identify with. Looking back is great because it helps me to praise God for my today. That i didnt allow my past predict my future. Instead used it as a stepping stone to move forward. I remind my children and grandchildren to take mistakes and learn from them. Your such a great teacher and writer. So happy your part of my life. Absolutely, Gloria – you are certainly a trophy of grace, and I’m so glad your life touched the Longenecker family. No, you didn’t allow your past to predict your future and have moved forward from there. Always good to “see” you here. What a transformation for one life to another . You have took the best of both worlds …good on yer. Everyone needs one friend with is “away with the fairies” and you are IT in my case. Thanks for appearing here often. What an interesting blog post…..you brought to surface so many of my memories at Lancaster Menn. School…….I graduated in 1960. In 1959 I wanted to play an accordion so my mother purchased one for me. Our family lived about 1 hr. South. so when my mother came for me on Friday (after staying in the dorm all week) she took me for my accordion lessons in Lancaster. By the way I am amazed how you find these very interesting “old pictures” to post on your blog…did you keep a photo album as a young person.?? Oh, I see this post really resonated with you as a former student. Obviously you can picture the campus layout in detail, even the Mill Stream bridge. Thank goodness, you had a kind Mr. Kreider to help you develop your accordion playing skills in spite of the rules. I’m glad we both can treasure the memories and not harbor bitterness for the restrictions, which are now part of the history. 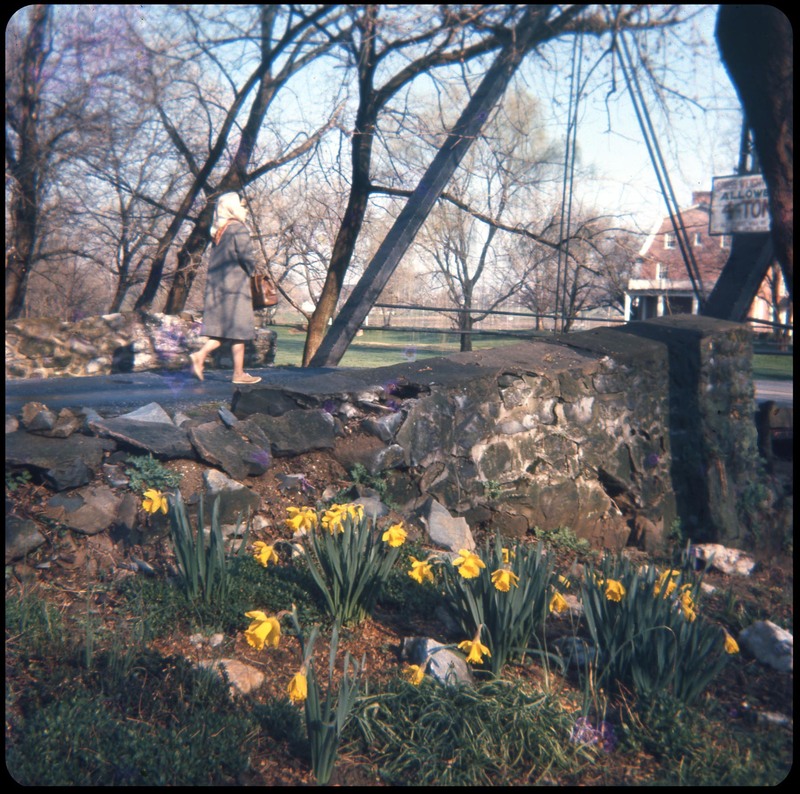 About the pictures, I did give credit to Verna Mohler (Colliver) who shared some of her photos and slides. You can read Verna’s response earlier in this column. Thanks for offering to send a pictures. By the way, I did access photos of your birthday celebration on Facebook, Bertha. Hope you had a happy one! Wow; your teaching experience was a LOT different than mine, although I can’t say that my lifestyle was significantly wilder than yours. I appreciate the open-minded, multi-racial approach of the school’s modern incarnation! I’ve hinted at my background and past history before. Here are some details to fill in the gaps. Thanks for commenting here again. I really enjoyed your post today, Marian. Thanks for sharing. Love the photos too! Thanks, Jenn. You have great photos on your blog too, but I would venture to say none with people wearing prayer veilings – ha! What a wonderful post this is, Marian, and the pictures are excellent. Have you ever read the novel MOTHERHOUSE by Jeanine Hathwaway? The author is a former Dominican nun, and the details are based on her experiences and those of others as well. She’s a literature and writing teacher at Wichita State University in KS, and you two have very similar styles. No, I haven’t heard of MOTHERHOUSE or Jeanine Hathaway, but I’ll have to check her out. Thank you for the tip. All who write such stories are documenting both an inner and an outer transformation. You mention that she and I have similar writing styles. I take that as a compliment. Thank you always for the encouragement, Marylin. Marian, this is such a wonderfully rich step back in time. Even then your spirit of adventure and independence shone through! I am amazed at all the photos you have that capture the details of your stories. I had to chuckle because my association the going into the convent (Catholic) was one of dread when my Italian great grandmother Rose Ranze kept asking me “do you want to be a nun or do you want to getta married?” I was very relieved when my mother assured me I would know if I was called and that I could serve God in other ways. Phew, close call, I thought. 🙂 BTW, I enjoyed Karen’s memoir, The Summer of Yes, very much. Thanks , as always , for enlightening and entertaining us with your lovely stories. Ha! You can fill in the details of such a life more vividly than I can even though you never actually experienced convent life. Your grandma Rose’s question voiced the wishes and concerns of centuries of choice. What a dear your mother was to make clear that the options were more than just two. The photos are not all mine. My colleague and friend Verna shared many with me. What are friends for if not for sharing and caring. I’m glad you enjoy my stories. It seems strange now that I ever lived such a life, but so it is. Thanks, Kathy! When I look back I can scarcely remember the compliant girl I was. But then, it’s true we all change in some way to have a more fulfilling life. My transformation was more obvious, I guess, simply because it involved my external appearance. Think Maria in Sound of Music – sort of like that! Thanks for your insights, Debby! There you go, Susan. I see both rebel and sympathizer in your short anecdote here. Both virtues keep you (and me) peddling forward. It’s nice to see you in this column. Thank you! What wonderful photos and a wonderful story too. My life is very different to my youth too. After Mother was widowed we were very short on money and lived a simple life. There was a small black and white TV and two working electric sockets in our house. We had no gadgets and washed our clothes by hand. Most of my clothes were home made or second hand. Life today is comfortable if not excessive. I don’t think I’ve ever forgotten those days of little money and I hate waste and excess. Even so I have a car, computer, pleasant house and all the normal appliances. Mother would think I was rich if she could see me now. It sounds like your mum was a real trooper – you too! Like you, I abhor waste and excess. It bothers me when too many lights are on in the house or when someone runs too much water at the sink or in the bath. My parents witnessed the Great Depression and its aftermath in the 30s and 40s and some of that must have rubbed off on me. No, I’d have to say my life now is not much different than my growing up years and I am happy and content. It seems you have reached a peaceful place (maybe have always been there) as you say you are happy and content. One couldn’t ask for more. I’m sure a lot of this is based on a good attitude. Thanks always for reading and commenting here. I was a plain Jane back then, but so were so many others. At church I didn’t stand out, and there were so many Mennonites in our community my dress didn’t seem unusual. However, I always craved the “fancy,” sometimes consciously, sometimes unconsciously. I’m glad you enjoy these nostalgic forays, Anita. I would have been a sophomore at LMS in 1965 had I been allowed to attend along with the several of my cousins who would graduate there. Though probably not by your intent, this post moved me to tears. Oh, my. Thanks for responding here. I can’t quite tell whether these would be happy or sad tears. It’s always nice to hear from someone who understands the times and the culture. Again, thank you!